One of the most asked questions in our comments seems to be “Is FreshMac safe?” That is also the question that seems to come up in most FreshMac reviews out there. And since we are a security website, we perfectly understand the importance of this question, so we installed and tested FreshMac to determine whether the software lives up to its marketing, tag price, and if there are any shady practices it is involved in. A quick word: This FreshMac review is intended to be completely objective. If you feel the author is biased, please write back to us in our contact form and inform us which part of the FreshMac review you feel needs to be changed. We will leave the comment section below open to anyone who wishes to leave an honest opinion, but if you intend to say the software is “the best” or “the worst” we will ask for proof of purchase. This is simply to make sure our readers can get an unbiased opinion. The last thing you and I want is for the people behind FreshMac or their competitors to start writing here. A: FreshMac is a safe anti-malware program that can remove malware, adware and all other varieties of threats. It will also prevent new ones from installing themselves and act as a cleaner for your Mac. A: You might sometimes come across instances of this software being associated with computer threats, e.g. “FreshMac virus”, “FreshMac malware” and the like. However, as pointed out above, the FreshMac removal tool is perfectly safe to use on your machine. You can download the FreshMac installer from its official website. After you have downloaded the FreshMac software from the developer’s website, you will need to install it before you can scan your Mac. The process is very simple and all you have to do is double click the install file, which will open the FreshMac installer. Next, just click “Continue”, then “Install” and the FreshMac installer will do the rest. BUT! Here is a very big caveat – this is new software. It works perfectly right now, but we never know for how long the developers will be able to keep up the quality. Still, our verdict is that FreshMac is not only safe to use, but your Mac can benefit substantially from it. As of the time we are writing this FreshMac review there is almost no negative user feedback on FreshMac – and the negative feedback that does exist seems to focus solely on the price, which feels like these people are hoping to get a free meal out of it. Mac optimizer/cleaners generally have a fishy reputation, for one simple reason: many believe that free software can achieve the same results as a paid one. Let me be loud and clear on this – paid software will always be head and shoulders above any free one you can find. Free software tends to be made by enthusiasts or companies that want to popularize their other services through it. In both cases, this means a very limited amount of resources (read: money) was invested in the project and the overall quality and support suffer from that. Paid programs, on the other hand, are a “professional” class of software – everything negative about them starts and ends with the fact that you need to take money out of your wallet to use them. Yes, part of the profits are just that, profits for whoever created the software, but this also means that these people are more motivated to make the software better. This is when paid software truly begins to shine. In the case of FreshMac, my honest opinion on the matter as a security specialist is that if you value your machine and want to keep it secured, clean and fast – try FreshMac or another program of this type. If you regret the decision, you can always cancel your subscription. The reason I recommend this to you is that nowadays more and more malware is targeting Mac devices and these figures will just keep growing. The first thing I did with FreshMac was run it on my old Macbook Air 2014 (the link is to Apple’s website) just to see if it does anything at all. The first impressions definitely raised my eyebrows a bit. 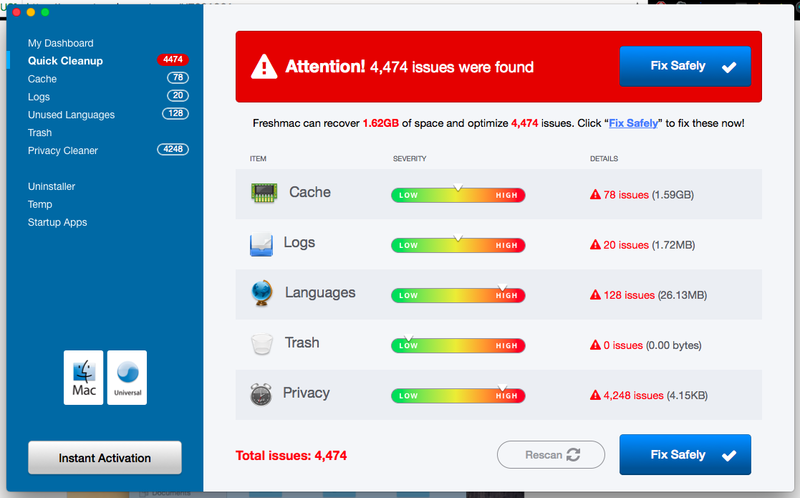 As you can see on the screenshot below, according to FreshMac, my Mac has 4474 issues on it. To my knowledge, if there truly were that many issues, my Mac would be garbage by now – so one negative strike here for overestimating the problems. Why is FreshMac finding so many issues? A closer look at the FreshMac scan log reveals that 4248 of the 4474 issues were so-called “privacy” issues, which is to say many cookies and other browser-related stuff – the entirety of these 4000 issues resulted in a total of 4kb, which is vastly inferior to the other ones it found. Another Mac I tested the FreshMac removal tool on had a whopping 66613 issues – again, about 99% of them were privacy issues. A lot of programs do this. They count every single tracking cookie as a virus or a problem that needs to be fixed immediately. Without any context or explanation, you are left lacking the full picture. What happens in reality here is that these “issues” are simply cookies that allow Google and other websites to offer you targeted ads – yes, the annoying kind, but hardly an “issue.” This is a marketing strategy that can be very misleading if you don’t understand what you are looking at. Some of the programs and adware that we have found with FreshMac are Weknow.ac, Safe Finder, My Quick Converter and Similar Photo Cleaner all of which have been vulnerabilities at some point. There was malware called Safe Finder on the second machine I tested (the one with 66000 issues). If you do a quick Google search you will find that it is a huge issue that’s been plaguing users for years. The malware redirects users to shady websites and offers them unsafe advertisements – and FreshMac absolutely took care of it in a matter of seconds. The problem did not reoccur after. I am highly confident FreshMac is one of the best Mac cleaners out there if you are battling malware. I’ve been using a Mac for 8 years and I pretty much know how to clean it myself, but I was very pleasantly surprised to find out that FreshMac sped up the process by at least 25%. I don’t have the necessary tool set to estimate exactly how much, but it was absolutely a noticeable difference. So, the bottom line is: despite the confusing marketing, FreshMac performs well on all fronts and is definitely money well-spent. 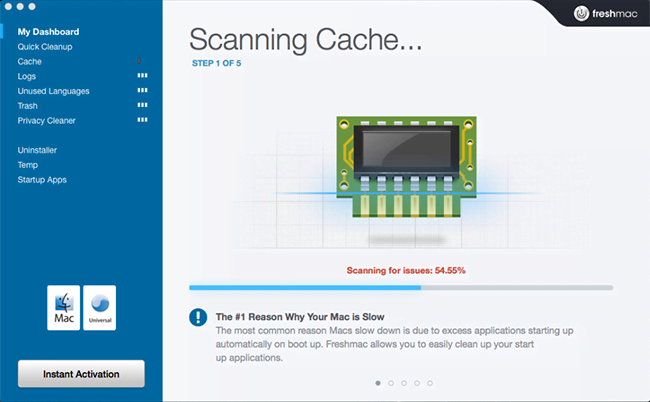 FreshMac offers a One-Touch scan, which is done very quickly and can contribute to improving the system performance. FreshMac offers you the functionality to remove duplicate files from your system. It has a user-friendly interface and is extremely easy to use. Do you have any experience using FreshMac yourself? We want to hear about it! Please tell us all about your thoughts on the FreshMac removal tool in the comment section below. if you liked my FreshMac review, please like and share it! Here IS the good news. News is a singular noun.